TRENTON-- Trenton native son Duncan Harrison officially put his hat in the Council At Large race Thursday evening at the Conservatory Mansion on East State Street. 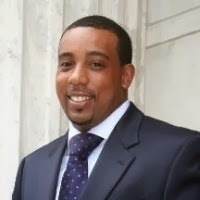 Harrison, an executive director at UIH Partners, a non-profit organization that focuses on fatherhood, said during the announcement that his roots started in Trenton, but then branched out when he decided to pursue a college education at Delaware State University, an historically black college. At Delaware State, Harrison majored in Sociology with a particular focus on Criminal Justice. After graduating from college, he went on to become a family assessment worker with Mercer Street Friends, a non-profit organization that provides "compassionate and practical solutions to the problems of poverty and health within Trenton, NJ" according to the candidate's LinkedIn profile. During his brief speech at the Conservatory, Harrison laid out his vision along with his plan to improve Trenton to a standing room only crowd of around 50 people, despite the inclement weather that evening. In the speech, the Trenton native cited the homicide rate (41 murders in Trenton in 2013 alone) and Trenton Public Schools dismal 48.6% graduation rate and said that he had plans to put 'more boots on the street' to address the violent crime issue. Harrison said that creating an auxiliary police force with more boots on the ground would not unduly burden Trenton's taxpayers. Harrison also went on to advocate community policing where police officers would work with different wards in the city to better serve the community. 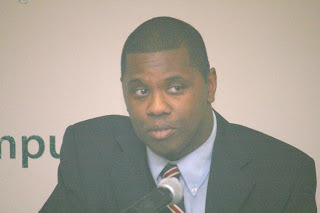 Later in his speech, the Trenton native said that he would also tackle issues affecting education by calling on the Trenton School District Superintendent to attend each and every city council meeting and provide the council with updates on each school's present condition so that each school would be up to par and not in deplorable condition as is the case now at Trenton Central High School. Harrison also said that Trenton should get out of the home ownership business as soon as possible as the city currently owns too many vacant or abandoned properties that do not collect property taxes. Lastly, the Trenton native went on to say that if elected to office he would not raise property taxes on Trentonians even though property taxes for the last twenty years have risen under the Doug Palmer and Tony Mack mayoral administrations. In his speech, Harrison also made that he loved the city of Trenton so much that he decided to move he and his family next to an abandoned building despite the blight surrounding his property. Before Harrison took the stage, one of his colleagues and longtime Trenton activist Darren Freedom Green stepped to the lectern to offer his remarks. Green said that as a council person, its important to bridge relationships with others, not critique the mayor. Green says that Harrison is willing to bridge those necessary relationships if elected council person at large. Green lastly went on to say that Trenton desperately needs programs and positive tangible examples like Harrison that others may be inspired by or strive to emulate. Indeed, Harrison's candidacy begs a lot of questions for me. The first question is: is the city of Trenton ready for some new blood or is too soon? Truth be told, Harrison has never held public office, but that is not necessarily a disadvantage. Two, how satisfied or dissatisfied are Trenton voters with the incumbents that currently hold office? Is Trenton hungry for a newcomer with fresh new ideas or are Trentonians in the market for someone that has been around the block and already knows the ropes? I don't know the answers to these questions, but I sincerely hope that the populace in Trenton will give them serious thought as Election Day approaches this May. For more on Harrison's candidacy, click here.